How does this sound for a good idea? Take the Louis Boston Building on Newbury Street gut the interior and construct a tall, slim skyscraper, similar to the ones found in Vancouver, preserving the original building, ala Hearst Tower in New York City. I personally hate the Hearst Tower but I don't think it is a bad idea (just poor proportioning). It's been done before but only because the Feds could circumvent the height laws in Boston. I doubt it would fly again, especially in the Back Bay. 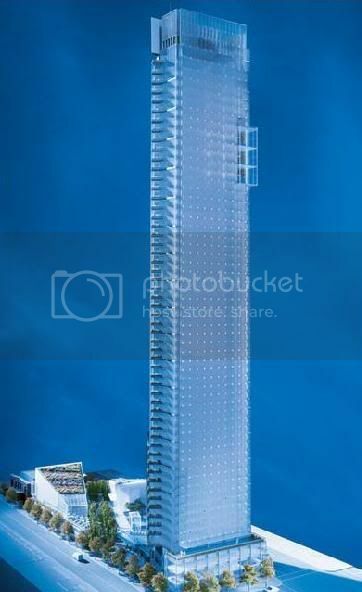 And from a purely design standpoint I think that building a glass tower would be pretty bad. The Custom House works because they used the same stone to knit the buildings together. This is another beef I have with Hearst, the glass clashes too much with the stone base. I would hate to see it repeated. I'd say no. This building should be perfectly reusable by another high-end retailer as it is. I'd say yes. But the shadow crowd is going to complain mightily and the Berkley Street entrance to Arlington Station would need to be open year round to handle the increased office crowds. It would certainly be a great thought exercise. I wonder if any students at the various architecture schools 'round town have proposed such a building? Edit: Looking at the building again I think the problem would be that for a development to make financial sense it would have to be quite tall and thus be all but impossible. If the Boylston Tower couldn't be built then this doesn't have a chance. What could work is taking the entire lot for a new tower with the old (Museum of Natural History/Bonwit Teller/Louis Boston) building kept at the core. Place some very significant columns at the perimeter and deep trusses spanning to the core set in the old building. Have a multistory atrium containing a year round garden (think a mini-indoor Post Office Square), as exists on the current site, to the face of the existing building. Essentially take the existing building, place it in a glass box, and build the new tower on top of that glass box, with the core set into the existing structure. But why do any of this unless the existing building proves to be unsalable or unleasable? It's a prestigious building in an ultra-desirable location. Ron, your lack of imagination is sometimes seriously depressing. Peter Banning at the beginning of Hook. It would be something very daring. Think of the interesting juxtaposition. And I'm not thinking of a big glass box, I'm thinking of something along the Vancouver model, with mostly residential. The building has been poorly maintained and Louis wasn't paying anywhere near the market rate rent for it in good times. Now with the economy on the ropes and the sorry state of the building, somehow I doubt it's going to find a new tenant at anything but a fire-sale lease. The prestige of the building, when talking about retailers, is overrated. Is the old Shreves building on a prominent corner with subway access attracting bidders for the lease left and right? No! Place some very significant columns at the perimeter and deep trusses spanning to the core set in the old building. Have a multistory atrium containing a year round garden (think a mini-indoor Post Office Square), as exists on the current site, to the face of the existing building. Interesting thought. Calls to mind SOM's unbuilt Transbay Proposal. If putting an ultra-thin skyscraper in the building can't work, maybe we can pick the building up, move it to where the parking lot on Newbury Street is, and build a skyscraper. Other than that, I believe this can be done properly if you have the right architect and the right planner. This building never seemed very welcoming as a location for retail. I didn't even realize it was a store or that you were allowed to go in there until a few years after I moved here. This was my issue with the building - I always thought it was a high end restaurant due to the valet parking and never thought I could poke my nose in. Move it down the street to the surface parking lot and add an expansion of the New England Life building. It did contain a high-end restaurant as part of the Louis store. Before it was Louis, it was Bonwit Teller. I don't know if any other retailer preceded them. Originally it was the Boston Museum of Natural History, whose successor is the Museum of Science on the dam. Featuring the Boston Society of Architects? Harvard Numismatic Collection: Could work in the space, but would it be better in Cambridge at Central Square? Peter Luger's Steak House: I don't think they're expanding outside of New York City at this time. On another topic ablarc, I am a big fan of your ideas for Central Square in Cambridge. Do you have any pictures of what you envision for this part of Cambridge? I like the idea of preserving nice architecture and historical buildings, but honestly if there is nothing special inside, this idea would be great. Our population as humans is growing and we need more space. Building on old buildings help preserve open land without destroying a nice looking building. Ditto Monopoly Bag. It would be pretty nice to have something designed by Calatrava or Nouvel coming out of that structure. Im sure Menino would ok it because the base is a box anyway. And he likes buildings like that.